Click here to view the latest sporting news and events! Our aim is to raise the awareness, knowledge and abilities of all students, in relation to the health, social and emotional benefits of sport. We want all students to enjoy sport and exercise, and to learn the skills to maintain an active lifestyle into adulthood. We pride ourselves on the breath of the extra-curricular provision. Each student experiences a broad and balanced programme that draws on the key elements of the National Curriculum. Every activity has its own particular expectations which match the end of Key Stage descriptions. 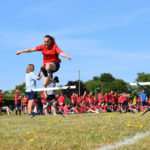 Students study units of works taken from Rugby, Netball, Football, Hockey, Basketball, Badminton, Volleyball, Table Tennis, Rounders, Cricket, Athletics and Tennis. Students not only have the opportunity to develop as performers, but also expand their understanding through taking on roles such as coach, official and choreographer. Students can also enjoy attending the residential Spanish Football Tour, Ski Trip, Calshot Trip, a day trip experiencing the Sports Science facilities at Bath University, and numerous opportunities to attend live sporting events. In year 7, students receive initially a ‘skills based’ curriculum where through which Core Strands vital for all sporting success as assessed. Students aspire to be Masters of Stamina, Spatial Awareness, Skilfulness, Stance and Strategy through a varied activity programme. 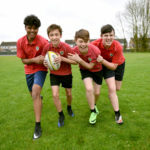 In year 8, students will further develop the performance of a range of sports through increasing their skill base and applying them to full game situations. The five Core Strands remain a focus to assess effort and achievement. Theory content will continue to be explored, with an end of Year test assessing the students’ knowledge of the content covered over the two years at Key Stage 3. Within core physical the breath of study is expanded and emphasis is placed on the application of core skills within competitive situation. The year 9 academic PE curriculum consists of a programme designed to give the student a greater awareness of Academic PE. It builds on Year 7 and 8 and develops knowledge of the body systems and Health & Fitness. The students complete the NCFE Health and Fitness Level 2 course . This again builds on the students studies in years 7,8 and 9. It covers the Body systems and Fitness for the examination taken March Year 10 and is 40% of the course. The pupils then apply further knowledge to an external set coursework scenario that is developed with the end of year 10 and year 11 . This equates to 60% of the course marks. The well-equipped Gymnasium, Sports Hall, extensive playing fields and Tennis Courts are fully utilised every day. Also at break and lunch times there are mini outdoor basketball pitches and a traversing climbing wall. The school offers a large choice of extra-curricular sporting clubs which take place at lunch times and after school. We pride ourselves on the quality of this and this success within this area. To see this terms sporting clubs click here. The latest match results can be viewed here.